Don’t miss an exciting opportunity to get a hands-on, behind-the-scenes look at New York’s oldest museum in this immersive camp for Middle School students. After exploring centuries of artifacts and artworks from the New-York Historical Society’s collections, campers will put their imaginations to work creating hands-on projects with educators, historians, designers, and conservators. By the end of the week, each campers will: learn how curators care for and research collections, act as historians to build their own unique exhibition about a topic of their choice, and become designers using the technology of the future to illuminate the past with 3D-modeling software and 3D printers. Fee includes snacks and materials. Participation in Camp History is $500 for the week ($400 for members). 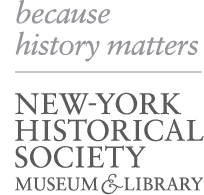 Advanced registration required; contact camphistory@nyhistory.org before March 15th, 2013. Please note, this program has been rescheduled from February due to the change in the public school schedule.